Resolving the smallest to the grievous of the country’s problems requires collective action from people who believe strongly that their common aspirations can transcend all kinds of barriers. This includes our scientists whose role is to take research a step further and explore uncharted territories rather than just putting them on paper. Just ask Dr. Raul V. Destura – he and his team did just that. Dengue, a mosquito-borne disease, becomes most dangerous when not treated early; and one of the main reasons why it costs lives is prolonged detection of the virus. Data from the Dengue Disease Surveillance Report of the Department of Health show that a total of 58,598 dengue cases were reported nationwide in the first half of 2017, most of those cases belonged to children age 5 to 9 years old (Department of Health, 2017). While the casualties mount, the burden of combating the disease is carried mostly by those in the marginalized sector who will have to shell out P7,000 to P8,000 to take the Polymerase Chain Reaction (PCR) test – the popular dengue detection method – to know if the symptoms they are suffering from are those of dengue fever or not. Seeing the need for a more accessible and accurate option, Destura, as lead scientist, developed a dengue-diagnostic kit that harnesses the power of molecular-based technology minus the significant expense attached to it. Hence, the creation of Biotek-M™Dengue aqua – a commercialized, locally-developed technology that detects the presence of the fatal infection in the first 0 to 5 days of illness. “Biotek-M™ is a molecular test that amplifies RNA (ribonucleic acid) products with a simple heating device. It’s simpler, easier, and cheaper than the standard molecular test the world enjoys,” he said. While Dengue NS1 Antigen and the PCR are the commonly used dengue-diagnostic tests in the country, both have their pros and cons in detection and accessibility. “NS1 picks up the disease in the first 0 to 5 days of illness. Unfortunately, the results of the test are affected by the immunological status of the patient. Kung kailan nagiging secondary dengue – ito ‘yung mas severe na ang manifestation – doon bumabagsak ang sensitivity pa lalo ng NS1 to as low as 40%. This means that the technology fails at that point when you need it the most. A molecular test like PCR similarly can pick it up. And it’s really good! Sensitivity can go as high as 95%. Unfortunately, a powerful technology, but a very few can access them,” Destura notes. Depending on the number of tests you run, the cost per test for NS1 is P800 to P3,000;for PCR, it is around P4,500 to P7,000. 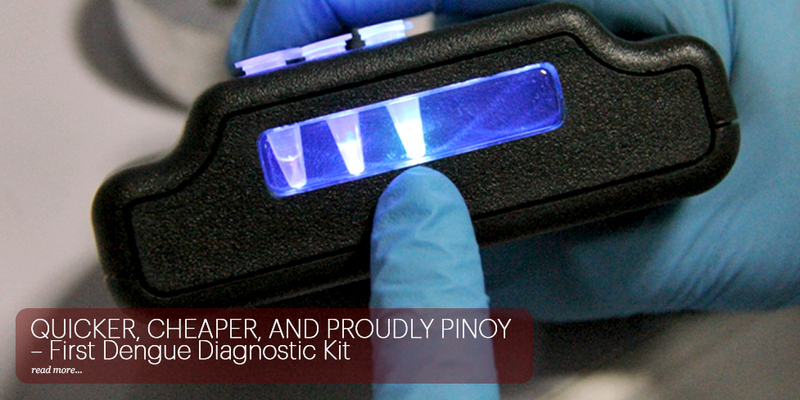 Biotek-M™ costs only a third of that which amounts to P700 to P1,500. In addition, the kit is designed in a very simple way. First, the nucleic acid is extracted from the blood and transferred to small vials. The vials are then placed securely inside the improvised heating tube made of PVC pipe, and are heated at the right temperature (63°C) until the thermometer indicates that the samples are ready. In less than an hour, the vials will be transferred from the heating device to the LED transilluminator. Against the blue light, the samples will change into green if the blood is positive for dengue or will maintain its orange color if it is clear of the fatal disease. Through Biotek-M™, doctors would make better decisions for their patients if they can confirm or rule out dengue the soonest possible time. Moreover, institutional units or hospitals would not have to admit every patient suspected of dengue. This would translate to better delivery of healthcare to the patients – the hospital would have fewer admissions, the staff will have more time to attend to other patients, and there will be more available resources to patients who need them the most. Think of it this way: Biotek-M™ crosses three hurdles with one leap. It is accurate, time-saving, and low-cost Filipino-made technology that provides access to the marginalized sector. In 2010, Destura and seven other co-inventors composed of infectious diseases specialists, molecular biologists, and biotechnologists received a grant under the Lab-in-a-Mug project funded by the Department of Science and Technology’s Technology Innovation for Commercialization and Technology Application and Promotion Institute, Philippine Council for Health Research and Development, Philippine Genome Center, and the University of the Philippines System. According to Destura, all diagnostic kits under this project are integrated and miniaturized in an isothermal unit as small as a “mug” that will function as a multi-infectious disease diagnostic device similar to a portable laboratory. The “Lab-in-a-Mug” was also conceptualized, designed, and piloted at the Institute of Molecular Biology and Biotechnology, National Institutes of Health, University of the Philippines Manila with Destura as project leader. In the pipeline are testing kits for tuberculosis, salmonella, chikungunya, influenza, malaria, schistosomiasis, leptospirosis, Zika, and paragonimiasis, which already have their proof of concepts and will set off once funding is secured. The funding enabled the team to conduct the study, which they completed in almost two years from 2010 to 2012. Having a shared goal of identifying a common and deadly virus at its early stage, Destura and his team have untangled a new method of detection that is within reach of the Filipino people, unlike the previous inventions. “First we identified a need for technology, then we discussed what the best platform technology is for this particular problem, and then we arrived with technology using isothermal amplification. After deciding what platform to use, the experimental methods were done for proof of concept. After finding the proof of concept that it is feasible, the laboratory performance testing assay on known standards and controls followed. When it passed laboratory performance assay, we identified the analytical sensitivity and specificity based on laboratory performance. After getting the number, we proceeded with clinical validation study to test it with actual patients needing it,” Destura explained. Getting the sample size complete was a major challenge to test the effectivity of the kit. The first trial required over 100 patients and the second consisted of more than 500 patients. Getting the consent of that magnitude of patients was another issue, considering that not everyone wants to be part of the study. The team got most of their patients from the National Children’s Hospital, Philippine General Hospital, and the Medical City. The Manila HealthTek Office stands in Marikina where the kits are currently being mass-produced. But since the team initially developed the kit as part of a research and development program funded by several organizations, they had to secure their approval, apply for alicense, and comply with regulatory processes before formally commercializing the kit. For three years, the company had to diversify its services to sustain their income while waiting for the rights to be granted. Finally in 2016, the rights to commercialize the technology was transferred to Manila HealthTek Inc.
“It needed a lot of capitalization. But it has entered the mainstream market which is the Department of Health. We are going into sectional discussions with the local government units and private hospitals to take in the technology,” Destura added. The Manila HealthTek is not limited to Biotek-M™. It is also dedicated to developing, manufacturing, and distributing technology for diagnostic medicine. They promise quality and accurate diagnosis of communicable and non-communicable diseases at a fraction of a cost. Its Research and Development Division and Molecular Diagnostic Services Division help provide the necessary support to local and international scientists from designing the laboratory component of their research proposal to expanding their market reach. Aside from problems concerning design, laboratory performance assay, clinical validation, and marketing analysis, there’s also the issue of scrounging for funds. Indeed, it has taken years for Biotek-M™ to fly off the ground but when it did, it achieved noteworthy success. The Department of Health recognized this major advancement in dengue detection and made it into a policy to be the second confirmatory method of the Dengue Diagnostic Program. “We became the second-line testing for Dengue. If NS1 turns out to be negative in its result, it will be re-tested using the Biotek-M™,” Destura said. Destura and the team are looking further down the road for innovations even if the kit is still on the roll-out. He said that the drive to create innovations in healthcare delivery is fueled by one simple thing: love for country. Every individual has a critical role in working on something great for this country. These scientists are willing to play their part in technology development, powerful enough to bring acceptable, accurate, and affordable health care within reach of the Filipinos. UPDATE: The Biotek-M Dengue Aqua Kit is one of two Philippine inventions which won a gold medal in the 46th International Exhibition of Inventions Geneva (Geneva Inventions) in Switzerland held from 11-14 April 2018. The other is the Portable Smart Surface System. "World-class Pinoy Technology Wins Gold Medal"
This and other research articles in the forthcoming issue of UP Manila Health Ripples community magazine.